Dr. Harry Kerasidis, who oversees concussion care for thousands of student-athletes, gives 10 “Need-to-Know” Concussion Safety Tips in time for Fall / Winter sports. (Newswire.net — August 29, 2016) National Harbor, MD — Honoring National Childhood Injury Prevention Week starting September 1, prominent neurologist Harry Kerasidis, MD says parents of student-athletes, among all the others involved in sports, are being forced to face the realities of the mild traumatic brain injury, also known as concussions. For example, immediate action is required for sports teams across the country to comply with new statewide legislation regarding the elevated standards of concussion care, according to Dr. Kerasidis, co-founder and science director of XLNTbrain Sport™. Find your state’s concussion safety laws below. Also, in new research being presented by Dr. Kerasidis at the 2016 International Organization of PsychophysiologyWorld Congress meeting in Havana, Cuba, August 31-September 4, concussions and related effects on the brain can now be identified using “brain mapping” technology. Concussion incidence rates are higher than you think. An estimated 3 million concussions occur every year, according to the Center for Disease Control. For children under the age of 5, the highest culprits of concussion injury are falls from car seats and strollers. Additionally, brains are particularly susceptible to concussion injury at younger ages, and continues to develop through the age of 25 years-old. Know your state laws. With regards to sports participation, there’s a good overview here from Momsteam Institute, as well as this one from USA Football. New minimum standards are being implemented every year, so keep yourself updated annually. Educate yourself about concussions. Start with learning the basics about the brain, signs and symptoms of concussion, and what to do when a concussion is suspected. Assign a “Concussion Coordinator.” Volunteer, select or elect someone to help take the lead with helping the team with education, baseline testing, and monitoring the practices and games. The Concussion Coordinator would be given authority to serve as a “Spotter” and alert the training or coaching staff of a possible concussion injuries. Get your athlete “baseline” tested. This is typically a neuro-cognitive test that measures memory, language and process speed prior to concussion injury. It establishes a baseline score for the athlete, and can help identify which athletes may be more prone to injury. I recommend using a baseline test that also measures emotional issues and balance. Use an onsite concussion assessment tool, like XLNTbrain Sideline Assessment Tool™. Select a concussion detection mobile app or other sports concussion assessment test to have on hand during the practices and games. Don’t move unconscious player. Loss of consciousness is the most obvious concussion symptoms. But it’s important not to move the unconscious player. Give it 30 seconds or so and if the player doesn’t respond, then begin CPR and call 9-1-1. When in doubt, sit them out. 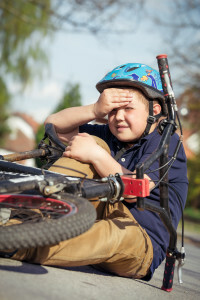 Many times, concussion symptoms do not materialize for several minutes, hours and days. So, if you suspect someone may be fighting off the symptoms, then pull them aside for five minutes and begin the onsite assessment test. Report the injury to your doctor. Before contacting your medical advisor, have as much data about the injury as you can gather, including time, date of injury, visible symptoms, injury description, and any data you can gather from the onsite assessments. Follow a recovery protocol for a healthy return-to-play or return-to-learn environments. After a concussion, the best thing to do is rest the individual. Avoid overloading the brain with input from movies, gaming, talking, texting, even reading. Sleep is the prescription. Then, begin the recovery protocol. This is a progressive-exertion protocol that allows the brain to heal, bringing it along in a way that does not provoke symptoms from re-occurring. Once the athlete can complete the recovery protocol, then seek medical clearance from your physician.